If your boss still don’t get Twitter then show him this little initiative cooked up by John Winsor, former creative chief at Crispin Porter + Bogusky. (We think it was him. This is Twitter. Things evolve here.) 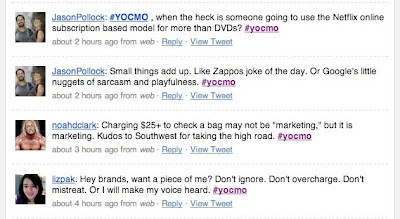 Toss a comment on Twitter with the hashtag #yocmo and your thought will pop up in a stream of comments telling chief marketing officers exactly what they should do with their business. Will CMOs listen? To the top complaints or concepts, yes. Ideas that resonate get retweeted, passed along by others, scaling until potentially tens of thousands of people are telling Netflix they want to move past DVDs to a web-streaming service that actually works. It’s an instant inbox. A crowdsourced product lab. A complaint discovery database. And chances are good that if you strike a chord, the CMO in question will write you back. Tell your Twitter-skeptical boss to pull that off with an email.